Law Web: Whether accused can be remanded to police custody from judicial custody within fifteen days of his arrest? Whether accused can be remanded to police custody from judicial custody within fifteen days of his arrest? Whenever any person is arrested under Section 57 Cr. PC he should be produced before the nearest Magistrate within 24 hours as mentioned therein. Such Magistrate may or may not have jurisdiction to try the case. If Judicial Magistrate is not available, the police officer may transmit the arrested accused to the nearest Executive Magistrate on whom the judicial powers have been conferred. The Judicial Magistrate can in the first instance authorise the detention of the accused in such custody i.e., either police or judicial from time time but the total period of detention cannot exceed fifteen days in the whole. Within this period of fifteen days there can be more than one order changing the nature of such custody either from police to judicial or vice-versa. If the arrested accused is produced before the Executive Magistrate he is empowered to authorise the detention in such custody either police or judicial only for a week, in the same manner namely by one or more orders but after one week he should transmit him to the nearest Judicial Magistrate alongwith the records. When the arrested accused is so transmitted the Judicial Magistrate, for the remaining period, that is to say excluding one week or the number of days of detention ordered by the Executive Magistrate, may authorise further detention within that period of first fifteen days to such custody either police or judicial. After the expiry of the first period of fifteen days the further remand during the period of investigation - can only be in judicial custody. A.M. Ahmadi and K. Jayachandra Reddy, JJ. 2. An important question that arises for consideration is whether a person arrested and produced before the nearest Magistrate as required under Section 167(1) CrPC can still be remanded to police custody after the expiry of the initial period of 15 days. We propose to consider the issue elaborately as there is no judgment of this Court on this point. The facts giving rise to this question may briefly be stated. A case relating to abduction of four Bombay based diamond merchants and one Shri Kulkarni was registered at Police Station, Tughlak Road, New Delhi on 16.9.91 and the investigation was entrusted to C.B.I. During investigation it was disclosed that not only the four diamond merchants but also Shri Kulkarni, who is the respondent before us and one driver Babulal were kidnapped between 14th and 15th September, 1991 from two Hotels at Delhi. It emerged during investigation that the said Shri Kulkarni was one of the associates of the accused one Shri R. Chaudhary responsible for the said kidnapping of the diamond merchants. On the basis of some available material Shri Kulkarni was arrested on 4.10.91 and was produced before the Chief Metropolitan Magistrate, Delhi on 5.10.91. On the request of the C.B.I. Shri Kulkarni was remanded to judicial custody till 11.10.91. On 10.10.91 a test identification parade was arranged but Shri Kulkarni refused to cooperate and his refusal was recorded by the concerned Munsif Magistrate. On 11.10.91 an application was moved by the investigating officer seeking police custody of Shri Kulkarni which was allowed. When he was being taken on the way Shri Kulkarni pretended to be indisposed and he was taken to the Hospital the same evening where he remained confined on the ground of illness upto 21.10.91 and then he was referred to Cardiac Out-patient Department of G.B.Pant Hospital. Upto 29.10.91 Shri Kulkarni was again remanded to judicial custody by the Magistrate and thereafter was sent to Jail. In view of the fact that the Police could not take him into police custody all these days the investigating officer again applied to the court of Chief Metropolitan Magistrate for police custody of Shri Kulkarni. The Chief Metropolitan Magistrate relying on a judgment of the Delhi High Court in State (Delhi Admn.) v. Dharam Pal and Ors. MANU/DE/0059/1981 : 1982 Cri L.J. 1103 refused police remand. Questioning the same a revision was filed before the High Court of Delhi. The learned Single Judge in the first instance considered whether there was material to make out a case of kidnapping or abduction against Shri Kulkarni and observed that even the abducted persons namely the four diamond merchants do not point an accusing finger against Shri Kulkarni and that at any rate Shri Kulkarni himself has been interrogated in jail for almost seven days by the C.B.I. and nothing has been divulged by him, therefore, it is not desirable to confine him in jail and in that view of the matter he granted him bail. The High Court, however, did not decide the question whether or not after the expiry of the initial period of 15 days a person can still be remanded to police custody by the magistrate before whom he was produced. The said order is challenged in these appeals. 3. The learned Additional Solicitor General appearing for the C.B.I. the appellant contended that the Chief Metropolitan Magistrate erred in not granting police custody and that Dharam Pal's case on which he placed reliance has been wrongly decided. The further contention is that the High Court has erred in granting bail to Shri Kulkarni without deciding the question whether he can be remanded to police custody as prayed for by the C.B.I. Shri Ram Jethmalani, learned Counsel for the respondent accused submitted that the language of Section 167 Cr. PC is clear and that the police custody if at all be granted by the Magistrate should be only during the period of first 15 days from the date of production of the accused before the magistrate and not later and that subsequent custody if any should only be judicial custody and the question of granting police custody after the expiry of first 15 days remand does not arise. 167. Procedure when investigation cannot be completed in twenty-four hours.-(1) Whenever any person is arrested and detained in custody, and it appears that the investigation cannot be completed within the period of twenty-four hours fixed by Section 57, and there are grounds for believing that the accusation or information is well founded, the officer-in-charge of the police station or the police officer making the investigation, he if is not below the rank of sub-inspector, shall forthwith transmit to the nearest Judicial Magistrate a copy of the entries in the diary hereinafter prescribed relating to the case, and shall at the same time forward the accused to such Magistrate. Explanation 1 - For the avoidance of doubts, it is hereby declared that, notwithstanding the expiry of the period specified in paragraph (a), the accused shall be so detained in custody so long as he does not furnish bail. Explanation II.- If any question arises whether an accused person was produced before the Magistrate as required under paragraph (b), the production of the accused person may be proved by his signature on the order authorising detention. (5) If in any case triable by a Magistrate as a summons-case, the investigation is not concluded within a period of six months from the date on which the accused was arrested, the Magistrate shall make an order stopping further investigation into the offence unless the officer making the investigation satisfies the Magistrate that for special reasons and in the interests of justice the continuation of the investigation beyond the period of six months is necessary. (6) Where any order stopping further investigation into an offence has been made under Sub-section (5), the Sessions Judge may, if he is satisfied, on an application made to him or otherwise, that further investigation into the offence ought to be made, vacate the order made under Sub-section (5) and direct further investigation to be made into the offence subject to such directions with regard to bail and other matters as he may specify. The Joint Committee, however, with a view to have the desired effect made provision for the release of the accused if investigation is not duly completed in case where accused has been in custody for some period. Sub-sections (5) and (6) relating to offences punishable for imprisonment for two years were inserted and the Magistrate was authorised to stop further investigation and discharge the accused if the investigation could not be completed within six months. By the Cr.PC Amendment Act 1978 proviso (a) to Sub-section (2) of Section 167 has been further amended and the Magistrate is empowered to authorise the detention of accused in custody during investigation for an aggregate period of 90 days in cases relating to major offences and in other cases 60 days. This provision for custody for 90 days intended to remove difficulties which actually arise in completion of the investigation of offences of serious nature. A new Sub-section (2A) also has been inserted empowering the Executive Magistrate to make an order for remand but only for a period not exceeding seven days in the aggregate and in cases where Judicial Magistrate is not available. This provision further lays down that period of detention ordered by such Executive Magistrate should be taken into account in computing the total period specified in Clause (a) of Sub-section (2) of Section 167. Now coming to the object and scope of Section 167 it is well-settled that it is supplementary to Section 57. It is clear from Section 57 that the investigation should be completed in the first instance within 24 hours if not the arrested person should be brought by the police before a magistrate as provided under Section 167. The law does not authorise a police officer to detain an arrested person for more than 24 hours exclusive of the time necessary for the journey from the place of arrest to the magistrate court. Sub-section (1) of Section 167 covers all this procedure and also lays down that the police officer while forwarding the accused to the nearest magistrate should also transmit a copy of the entries in the diary relating to the case. The entries in the diary are meant to afford to the magistrate the necessary information upon which he can take the decision whether the accused should be detained in the custody further or not. It may be noted even at this stage the magistrate can release him on bail if an application is made and if he is satisfied that there are no grounds to remand him to custody but if he is satisfied that further remand is necessary then he should act as provided under Section 167. It is at this stage Sub-section (2) comes into operation which is very much relevant for our purpose. It lays down that the magistrate to whom the accused person is thus forwarded may, whether he has or has not jurisdiction to try the case, from time to time, authorise the detention of the accused in such custody as he thinks fit for a term not exceeding fifteen days in the whole. If such magistrate has no jurisdiction to try the case or commit it for trial and if he considers further detention unnecessary, he may order the accused to be forwarded to a magistrate having such jurisdiction. The section is clear in its terms. The magistrate under this section can authorise the detention of the accused in such custody as he thinks fit but it should not exceed fifteen days in the whole. Therefore the custody initially should not exceed fifteen days in the whole. The custody can be police custody or judicial custody as the magistrate thinks fit. The words "such custody" and "for a term not exceeding fifteen days in the whole" are very significant. It is also well-settled now that the period of fifteen days starts running as soon as the accused is produced before the Magistrate. 5. Now comes the proviso inserted by Act no. 45 of 1978 which is of vital importance in deciding the question before us. This proviso comes into operation where the magistrate thinks fit that further detention beyond the period of fifteen days is necessary and it lays down that the magistrate may authorise the detention of the accused person otherwise than in the custody of the police beyond the period of fifteen days. The words "otherwise than in the custody of the police beyond the period of fifteen days" are again very significant. I see no insuperable difficulty in the way of the police arresting the accused for the second time for the offence for which he is now wanted by them. The accused being already in magisterial custody it is open to the learned Magistrate under Section 167(2) to take the accused out of jail or judicial custody and hand him over to the police for the maximum period of 15 days provided in that Section. All that he is required to do is to satisfy himself that a good case is made out for detaining the accused in police custody in connection with investigation of the case. It may be that the offences for which the accused is now wanted by the police relate to the same case but these are altogether different offences and in a way therefore it is quite legitimate to say that it is a different case in which the complicity of the accused has been discovered and police in order to complete their investigation of that case require that the accused should be associated with that investigation in some way. As Sub-section (2) of Section 167 as well as proviso (1) of Sub-section (2) of Section 309 relate to the powers of remand of a magistrate, though under different situations, the two provisions call for a harmonious reading insofar as the periods of remand are concerned. It would, therefore, follow that the words "15 days in the while' occurring in Sub-section (2) of Section 167 would be tantamount to a period of "15 days at a time" but subject to the condition that if the accused is to be remanded to police custody the remand should be for such period as is commensurate with the requirements of a case with provision for further extensions for restricted periods, if need be, but in no case should the total period of remand to police custody exceed 15 days. Where an accused is placed in police custody for the maximum period of 15 days allowed under law either pursuant to a single order of remand or to more than one order, when the remand is restricted on each occasion to a lesser number of days, further detention of the accused, if warranted, has to be necessarily to judicial custody and not otherwise. The legislature having provided for an accused being placed under police custody under orders of remand for effective investigation of cases has at the same time taken care to see that the interests of the accused are not jeopardised by his being placed under police custody beyond a total period of 15 days, under any circumstances, irrespective of the gravity of the offence or the serious nature of the case. These observations make it clear that if an accused is detained in police custody the maximum period during which he can be kept in such custody is only fifteen days either pursuant to a single order or more than one when such orders are for lesser number of days but on the whole such custody cannot be beyond fifteen days and the further remand to facilitate the investigation can only be by detention of the accused in judicial custody. 8. Having regard to the words ' 'in such custody as such Magistrate thinks fit for a term not exceeding fifteen days in the whole" occurring in Sub-section (2) of Section 167 now the question is whether it can be construed that the police custody, if any, should be within this period of first fifteen days and not later or alternatively in a case if such remand had not been obtained or the number of days of police custody in the first fifteen days are less whether the police can ask subsequently for police custody for full period of fifteen days not availed earlier or for the remaining days during the rest of the periods of ninety days or sixty days covered by the proviso. The decisions mentioned above do not deal with this question precisely except the judgment of the Delhi High Court in Dharam Pal's case. Taking the plain language into consideration particularly the words otherwise than in the custody of the police beyond the period of fifteen days" in the proviso it has to be held that the custody after the expiry of the first fifteen days can only be judicial custody during the rest of the periods of ninety days or sixty days and that police custody if found necessary can be ordered only during the first period of fifteen days. To this extent the view taken in Dharam Pal's case is correct. 10. The learned Additional Solicitor General however submitted that in some of the cases of grave crimes it would be impossible for the police to gather all the materials within first fifteen days and if some valuable information is disclosed at a later stage and if police custody is denied the investigation will be hampered and will result in failure of justice. There may be some force in this submission but the purpose of police custody and the approach of the legislature in placing limitations on this are obvious. The proviso to Section 167 is explicit on this aspect. The detention in police custody is generally disfavoured by law. The provisions of law lay down that such detention can be allowed only in special circumstances and that can be only by a remand granted by a magistrate for reasons judicially scrutinised and for such limited purposes as the necessities of the case may require. The scheme of Section 167 is obvious and is intended to protect the accused from the methods which may be adopted by some overzealous and unscrupulous police officers. Article 22(2) of the Constitution of India and Section 57 of Cr. PC give a mandate that every person who is arrested and detained in police custody shall be produced before the nearest magistrate within a period of 24 hours of such arrest excluding the time necessary for the journey from the place of the arrest to the court of the magistrate and no such person shall be detained in the custody beyond the said period without the authority of a magistrate. These two provisions clearly manifest the intention of the law in this regard and therefore it is the magistrate who has to judicially scrutinise circumstances and if satisfied can order the detention of the accused in police custody. Section 167(3) requires that the magistrate should give reasons for authorising the detention in the custody of the police. It can be thus seen that the whole scheme underlying the section is intended to limit the period of police custody. However, taking into account the difficulties which may arise in completion of the investigation of cases of serious nature the legislature added the proviso providing for further detention of the accused for a period of ninety days but in clear terms it is mentioned in the proviso that such detention could only be in the judicial custody. During this period the police are expected to complete the investigation even in serious cases. Likewise within the period of sixty days they are expected to complete the investigation in respect of other offences. The legislature however disfavoured even the prolonged judicial custody during investigation. That is why the proviso lays down that on the expiry of ninety days or sixty days the accused shall be released on bail if he is prepared to and does furnish bail. If as contended by the learned Additional Solicitor General a further interrogation is necessary after the expiry of the period of first fifteen days there is no bar for interrogating the accused who is in judicial custody during the periods of 90 days or 60 days. We are therefore unable to accept this contention. We see no inflexible bar against a person in custody with regard to the investigation of a particular offence being either re-arrested for the purpose of the investigation of an altogether different offence. To put it in other words, there is no insurmountable hurdle in the conversion of judicial custody into police custody by an order of the Magistrate under Section 167(2) of the Code for investigating another offence. Therefore, a re-arrest or second arrest in a different case is not necessarily beyond the ken of law. This view of the Division Bench of the Punjab & Haryana High Court appears to be practicable and also conforms to Section 167. We may, however, like to make it explicit that such re-arrest or second arrest and seeking police custody after the expiry of the period of first fifteen days should be with regard to the investigation of a different case other than the specific one in respect of which the accused is already in custody. A literal construction of Section 167(2) to the effect that a fresh remand for police custody of a person already in judicial custody during investigation of a specific case cannot under any circumstances be issued, would seriously hamper the very investigation of the other case the importance of which needs no special emphasis. The procedural law is meant to further the ends of justice and not to frustrate the same. It is an accepted rule that an interpretation which furthers the ends of justice should be preferred. It is true that the police custody is not the be-all and end-all of the whole investigation but yet it is one of its primary requisites particularly in the investigation of serious and heinous crimes. The legislature also noticed this and permitted limited police custody. The period of first fifteen days should naturally apply in respect of the investigation of that specific case for which the accused is held in custody. But such custody cannot further held to be a bar for invoking a fresh remand to such custody like police custody in respect of an altogether different case involving the same accused. 13. Whenever any person is arrested under Section 57 Cr. PC he should be produced before the nearest Magistrate within 24 hours as mentioned therein. Such Magistrate may or may not have jurisdiction to try the case. If Judicial Magistrate is not available, the police officer may transmit the arrested accused to the nearest Executive Magistrate on whom the judicial powers have been conferred. The Judicial Magistrate can in the first instance authorise the detention of the accused in such custody i.e., either police or judicial from time time but the total period of detention cannot exceed fifteen days in the whole. Within this period of fifteen days there can be more than one order changing the nature of such custody either from police to judicial or vice-versa. 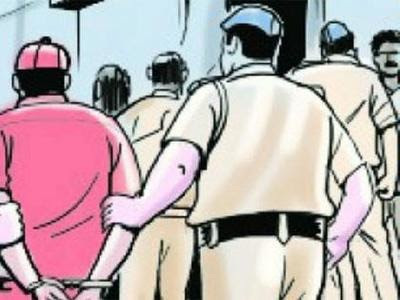 If the arrested accused is produced before the Executive Magistrate he is empowered to authorise the detention in such custody either police or judicial only for a week, in the same manner namely by one or more orders but after one week he should transmit him to the nearest Judicial Magistrate alongwith the records. When the arrested accused is so transmitted the Judicial Magistrate, for the remaining period, that is to say excluding one week or the number of days of detention ordered by the Executive Magistrate, may authorise further detention within that period of first fifteen days to such custody either police or judicial. After the expiry of the first period of fifteen days the further remand during the period of investigation - can only be in judicial custody. There can not be any detention in the police custody after the expiry of first fifteen days even in a case where some more offences either serious or otherwise committed by him in the same transaction come to light at a later stage. But this bar does not apply if the same arrested accused is involved in a different case arising out of a different transaction. Even if he is in judicial custody in connection with the investigation of the earlier - case he can formally be arrested regarding his involvement in the different case and associate him with the investigation of that other case and the Magistrate can act as provided under Section 167(2) and the proviso and can remand him to such custody as mentioned therein during the first period of fifteen days and thereafter in accordance with the proviso as discussed above. If the investigation is not completed within the period of ninety days or sixty days then the accused has to be released on bail as provided under the proviso to Section 167(2). The period of ninety days or sixty days has to be computed from the date of detention as per the orders of the Magistrate and not from the date of arrest by the police. Consequently the first period of fifteen days mentioned in Section 167(2) has to be computed from the date of such detention and after the expiry of the period of first fifteen days it should be only judicial custody. 14. We may, however, in the end clarify that the position of law stated above applies to Section 167 as it stands in the Code. If there are any State amendments enlarging the periods of detention, different considerations may arise on the basis of the language employed in those amendments. 15. The appeals are accordingly dismissed.